Nurse Daniels busied about her tasks, a bemused Captain Scarlet watching her. Since he had little idea about what she was doing, he agreed with any suggestions she made. Scarlet picked up the consultant’s notes and read through them. A lot of the notes went straight over his head. “I need Doctor Fawn to make sense of this lot,” he thought to himself. One thing that was clear, though, was that the World President was now off of the danger list, his comatose state had reverted to normal unconsciousness. He gazed at the sleeping form of the President. The face that had looked so tense and drawn on the video screens had relaxed and looked years younger. Scarlet’s train of thought was interrupted by a muttered curse from the nurse. “I’m sorry nurse, you were saying?” said Scarlet hurriedly. “This vial is empty,” she replied. “I distinctly asked for a new one. I’ll have to get a new one from the Dispensary.” With that, she left. As the door closed, a sound came from the bed. The President stirred slowly. Scarlet moved over to his bedside. and cloudy and eluded him, yet he knew that this was the face of a friend. He became aware that the face was speaking to him. glass and then gently tilted it to the President’s lips. “Easy, sir, easy, ” Scarlet advised him as he gulped down the liquid. “More?” Scarlet asked as the last few drops drained from the glass. At a nod from the President, Scarlet refilled the glass and again put it to his lips. Scarlet took the empty glass away and placed it carefully on the locker before helping the President to sit upright. “Th-thank you, ” said the President weakly. He looked slowly about him. “Where am I?” he asked. The President winced, the all-too familiar pain, like fire, seared through his skull. “Are you all right, sir?” asked Scarlet worriedly. “I… have… a… headache, ” the President gasped, slumping back onto the bed. Scarlet could only watch, powerless to help, as the President writhed in agony, wave after wave of agonising pain racking his tortured body. “What’s that ahead?” Captain Ochre had been the first to notice the faint glint of something further up the tunnel reflecting the headlights of the S.P.V. “Let’s take a look,” replied Grey, slowing the vehicle. As they got closer, a myriad tiny reflections sparkled, as if a million tiny fireflies were on the road in front of them. light reflected from the walls of the tunnel. Broken glass, the remains of the car windows, crunched under their boots. The sound echoed eerily in the tunnel. As they approached, they could see that the car had been gutted by fire. Both men felt their stomachs lurch when they saw the inside of the car. The four occupants were burned beyond recognition. Captain Grey found himself hoping that death had been instantaneous. As he turned away from the wreck, he noticed a yellow gleam on the road in front of him. He walked slowly towards it. Picking it up, he brushed the dirt from it. It was a car registration plate, the holes in it indicating that it had been torn free when the car had crashed. “What have you found?” asked Captain Ochre, noticing the plate in Grey’s hand. Sheepishly, Grey allowed the microphone to swing back up to the peak. Since there was nothing further they could do for the luckless passengers of the car, they once again took their seats. Quickly, the seats jacked themselves into position on the hatches which then slid shut. Captain Grey gently manoeuvred the bulk of the S.P.V. around the tangled wreckage before accelerating away down the tunnel, its tail lights turning the wreck to the colour of blood. A colour which faded and died as the vehicle disappeared from view. After what seemed hours, but in reality only minutes, the attack passed off. The World President lay on the bed, eyes shut, breathing shallowly. Slowly, he opened his eyes again. “How long have you been having attacks like that?” asked Scarlet. “I… can’t… remember,” answered the President weakly. Scarlet remembered it well. After the Mysterons had threatened to destroy the conference, Spectrum had been asked to ensure the safety of the delegates. On this occasion, however, they had only just succeeded. The mysteronised tanker aircraft had crashed into the conference hotel just seconds after evacuation had been completed. “Do you recall what happened?” asked Scarlet. The President concentrated once more. “There was some threat to the conference, ” the President said slowly as his memory drifted slowly back. His brow furrowed with concentration. “Some force called the Mys… Mys…” he faltered. “That’s it!” the President smiled. 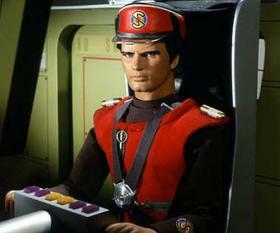 “The Mysterons. I asked Spectrum to ensure the safety of the delegates.” His memory was beginning to clear at last. “ I think they succeeded too,” he added as an afterthought. The change in the President was startling. Slumping back onto the bed, eyes staring, the very life seemed to drain from his face. “We have humoured these deluded individuals in their castle in the air for far too long,” he stated in a lifeless voice. “It’s time we stopped their fantasies about Alien Attacks from Mars.” His voice tailed off. He lay motionless, eyes staring blankly at the ceiling. Scarlet passed a hand in front of the President’s eyes. Nothing, no reaction at all. He was about to shake him then paused. The words uttered by the President sounded so familiar. He’d heard them only recently. Suddenly he had it. Scarlet leaned over the President and looked deep into his eyes. Was there a faint flicker of recognition deep within? Scarlet tried again. “Grayson,” he said, louder. This time there was definitely a flicker, the eyes narrowing momentarily. Scarlet knew that, if he were to try any further questioning on the subject, he could push the President over the edge into an abyss of screaming madness. He sat back, lost in thought. Perhaps Doctor Fawn would be able to find a cure for whatever it was that had afflicted the President. He’d have to find a way of getting him to Cloudbase. His thoughts were interrupted by the door opening. Expecting the nurse, he turned back to gaze at the patient. “Thank you, doctor. That will be all.” Scarlet turned his head slowly towards the visitor. The voice had been horrifyingly familiar, he’d heard it many times before. One glance confirmed it. GRAYSON! “Even so, Senator-” Scarlet began. “Very well then, but I must ask you to keep it as short as possible.” Scarlet knew he was beaten. To check with the consultant would probably result in his cover being blown and subsequent arrest on who knew what trumped up charge. He stood up. and have a friendly chat with the guard who had discovered the President’s comatose form and try to discover whether the President had received any visitors before his attack. Since his interview with the President, Scarlet knew that this was, indeed, the case. He also had a pretty good idea of who that visitor was, but he needed proof. Scarlet knew now that he would definitely have to speak to the guard. He’d been on duty outside the door of the President’s room when Nurse Daniels had taken Scarlet in to look at him. Now, however, he’d been replaced. The replacement snapped to attention as Scarlet approached. The man was a lot younger than Scarlet, a fact that the Spectrum officer put to good use. “I, ah, well, that is he said something about going down to the cafeteria for a drink,” stammered the guard under Scarlet’s ferocious stare. Fortunately, Scarlet had seen signs for the cafeteria on his way up here, so he knew where it was. “Thanks!” he called back over his shoulder as he sprinted down the corridor. The guard shook his head wearily. These doctors were all the same. Yell at you one minute, thank you the next. At least you knew where you were in the Army. At least, you did when the politicians kept their bright ideas to themselves. He watched bemused as the young doctor that had just asked him where his mate was ran straight into a much older one, bowling him over. “And where do you think you’re going young man?” fumed Jaeger as he picked himself up from the floor. Jaeger raised his eyes heavenwards. If only these young housemen would reserve that sort of thing for their spare time. On reflection, hadn’t HE been just the same in his days as a houseman? He sighed. “Go on then. I can’t be bothered to reprimand you now. I have a very important patient to treat. But don’t let me catch you running in the corridor again.” As he turned away to walk towards the President’s room. “No sir. Thank you sir, ” Scarlet called after him before turning the corner and sprinting for the lift. Jaeger heard the distant sound of running footsteps and sighed. That young man was going to end up in a lot of trouble one day. As the lift doors slid shut, Scarlet breathed a sigh of relief. The man he’d just bumped into was obviously the consultant under whom the President was being treated. Fortunately, he’d assumed from Scarlet’s manner that he was a newly qualified doctor. It would have been interesting, Scarlet thought, to follow the consultant to the President’s room and see his reaction to Grayson’s presence there. However, without a reasonable explanation, that was going to arouse the consultant’s suspicions. Scarlet’s luck had held for too long already. No. It would be better if Scarlet carried on with his original aim of seeing the Security guard and leave Grayson to the Consultant who would, no doubt, call Security and have him removed. That was a prospect that Scarlet found most enjoyable. The lift came to rest and the doors slid open. Scarlet stepped out into a large dining hall, tastefully decorated with potted palms and plants. In the middle was a small pond into which a small fountain splashed merrily. Recorded birdsong floated gently from hidden speakers. The overall effect was of a large indoor garden. Scarlet decided that it could be very restful, somewhere to relax and have a meal after a long day on the wards. This early in the morning, most of the tables were empty, the few customers being night workers. Scarlet’s gaze passed over the room and soon located his quarry. Sergeant Harker was sitting at a table enjoying an early breakfast. Scarlet’s mouth watered at the sight of the food. He hadn’t eaten for hours. Harker, chewing on a mouthful of food waved Scarlet to a chair. Scarlet waited for the sergeant to finish before starting to question him.